Artist Renee St. Peter’s delicate, ethereal watercolors transport the viewer to a world of dreamy landscapes and other intriguing visuals. Enjoy and view more by visiting her website. My lifelong art journey has led me to my current path of creating “Watercolors Unglassed.” From #2 pencils on notebook paper through colored pencils, pen, ink wash, scratchboard and pastels, I have also enjoyed quilting, jewelry design, and even tying fishing flies. Combined with my career in graphic design and advertising, all these experiences have honed my knowledge of layout and composition, including color harmonies, contrast, and storytelling. I consider myself primarily a portrait painter, focusing on landscapes, horses and weathered or rusty objects. In landscapes, I limit the details to a small portion of the scene. Large, colorful skies or rich, dark foregrounds balance these well-described areas. By combining elements from multiple photos, the viewer finds familiarity in the shape of a mountain, the turn of a path, or the pattern of trees, without being in a specific place. The unspecified foreground allows each person to create their own story of how they arrived at the scene before them. My portraits of horses usually feature the animal in a relaxed state with a soft, calm eye that gives each painting a quiet energy. I begin all portraits with the eye(s) and ears, which tell us so much about the personality and attitude of the subject. Indistinct backgrounds with subtle value blends and muted colors give viewers the freedom to create a place or recall a memory of a beloved companion. Weathered wood, peeling paint and corrosive rust give me a chance to play with texture and color. Getting “up close and personal” with an item reveals shapes and details we may not always notice, and showcases the sometimes delicate patterns created by time and wear. While my early work was very controlled and detailed, I always had an interest in the freedom of watercolor. Learning the medium has been a life lesson in letting things happen as they will. 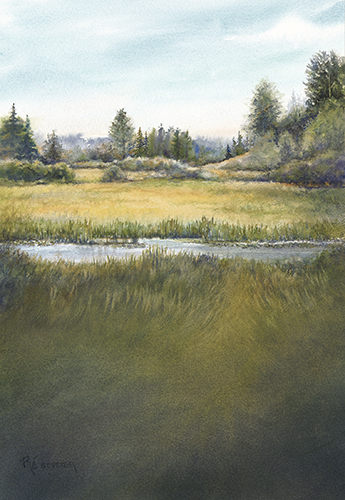 The magic of watercolor is not what it does in the first five minutes, but what occurs as the paint has time to react with other colors around it to create new shades and tones. I work on both paper and textured canvas, choosing the surface that best conveys the story of a painting. Paper allows me to achieve rich colors and more detailed renderings, while textured canvas results in a more expressive, less controlled look. All my works are varnished for protection, eliminating the need for glass. This “Watercolors Unglassed” presentation creates an entirely new relationship between the viewer and the painting, as there is no barrier or distracting reflections. My color palette is rooted in 8-10 favorites that create a unified look across many pieces. To allow a more spontaneous workflow, I have created mixing and blending journals to thoroughly acquaint myself with the unique characteristics of each pigment. Knowing the personalities of each color and how they react together has made my work more instinctive and less labored, adding to the ease and calmness portrayed in my paintings. Artist Renee St. Peter invites you to follow her on Facebook and Instagram. i like the texture paintings of closeup rust and smooth metal. I loved the horses in that dramatic group pose, with the great highlights on their backs.